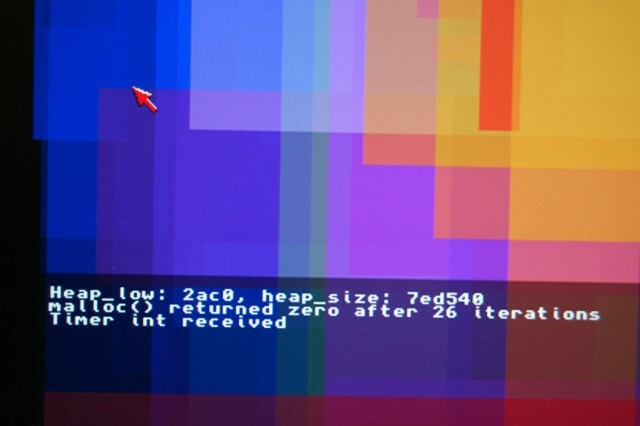 The previous instalment of this project saw a working VGA framebuffer being filled by an automated hardware process. Since then I’ve managed to get the TG68 processor running a program from a blockram-based ROM, and writing to the DE1 board’s SDRAM. 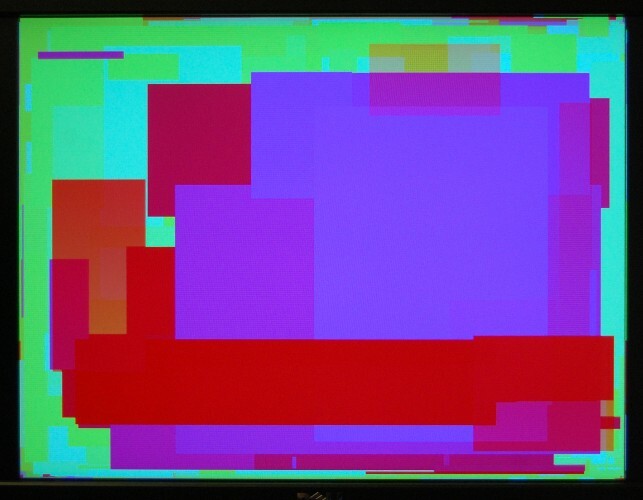 The ROM program currently backfills the screen, then draws random rectangles in an incrementing colour. The display is Hi-Colour (5-6-5) bit, which is dithered to fit the DE1’s 4-bit-per-gun output. The complete project, for anyone who’s interested, can be found here. Currently the fill-rate is pretty lousy since only a single 16-bit word can be written per slot. I need to add a writethrough cache of some kind, preferably one capable of merging successive writes to a single burst. CPU cache – separate instruction and data. Just one burst (64 bit) initially. Writeback cache – to allow (a) the CPU to continue working while a write is in progress, and (b) to gang sequential writes into a single burst write. Sprite controller – just one sprite for mouse pointer. Sprite controller. Just one sprite, for a mouse pointer. Hardware registers for framebuffer address, sprite position, PS2 data, etc. Here’s a little demo program written in AMOSPro demonstrating how to use the “GSTrack Loop” commands from the GameSupport extension. For this demo I used Yannis Brown’s cover of Tequila Slammer, found on Aminet. When the program starts up, just the first two patterns in the module will play repeatedly, until you press a key, at which point the rest of the song will play. As the song plays, the demo will report on any “command 8” events reported by the playroutine. Command 8 is unused in ProTracker, so it’s a useful method of synchronising program events with the music. Any time you press the space bar, the program will play a “jingle” (the last pattern of the song, in this case), then pick up where it left off.